Some are suited to off-road riding, some to track days and some for general commuting and city riding. Foot and lower leg injuries are also very common in motorbike accidents so it’s vitally important that you buy the right boot for your riding, because they each have different attributes. 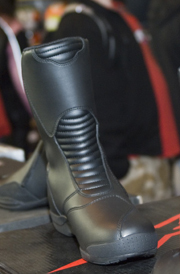 Motorbike boots for tourers and commuters place comfort high on their agenda as they need to be suited to riding long distances. That means they’re supple and offer plenty of grip on footpegs, but it also means they’re suited to all kinds of weather conditions, too. There’s also plenty of emphasis on protection too, and they will usually be leather and between 10 and 14 inches in length, covering your foot and ankle. Cruisers are bikes like Harley Davidsons and if you’ve seen your average Harley rider, you’ll notice they don’t usually place too much emphasis on protection. Instead there’s a heavy focus on aesthetics and style, which is why most cruiser boots tend to look like normal work boots. Usually they’re made from leather, or similarly heavy duty materials, and will cover the foot and ankle. Motorbike boots for off-road use are pretty much the opposite of boots for cruisers. They’re brash, high on protection and sometimes go all the way up to a riders’ knee to protect their shins and legs when thrashing about in rough terrain. As well as protection, these boots need to be flexible enough to cope with rugged ground – they’re usually pretty expensive. Like off-road boots, racing boots put protection ahead of anything else because speeds will be much higher than say riding on a cruiser or commuting. They usually combine leathers and synthetics with tough metals and plastics. Motorbike racing boots will generally come up over the ankles, again to protect the lower leg and foot against the affects of a crash on tarmac and gravel. They are also unique in that they tend to be much easier to get on and off quickly however this also means they’re normally more rigid – everyday activities isn’t be easy in racing boots. When you stop off for lunch halfway through a ride you can whip off your jacket, pull of your gloves and squeeze your helmet from your shoulders, generally your boots stay on. This is a downside because, while protection is the most important aspect of your boots, comfort needs to be high on the agenda too. As a result, you don’t want to get a pair that hurt or distract you and the best way to avoid that drama is by trying them on. That means buying online is a bit difficult, unless you’ve already tried them on, as they need to fit properly. There’s also a wide choice of fastenings, zips or buckles that will probably crop up during your boot search. Again, this is something that is difficult to decide unless you try them out. Make sure they are sturdy too, they should be at least 2.5mm thick and have a solid, 4mm thickness on the sole.